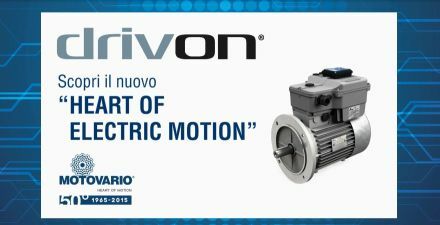 DRIVON, Motovario's new inverter motor. Discover it at Hispack and SPS Italia. Two important events, two unique opportunities to discover Motovario's “new heart of electric motion”: Drivon. After its launch at the SPS trade fair in Nuremberg (an important global event in the field of mechatronics), Motovario will be introducing its new inverter motor to the Spanish market as well by exhibiting at Hispack in Barcelona, from 21st to 24th April. The company has also decided to participate in the important Italian trade fair SPS in Parma, thus marking its return to the Italian exhibitions after several years of absence. This repatriation will be an important occasion to present the Drivon inverter motor: a entirely Made-in-Italy project that will be on display from 12th to 14th May. The Drivon unit is designed for use with different types of applications (especially pumps, fans and conveyors), and is controlled by software that guarantees excellent performance, above all in terms of energy efficiency.